Caribbean Hold'em™ Poker is a variation of everyone’s favorite classic, Texas Hold’em. Win the Progressive Jackpot with a Royal-flush on the first five cards. Get an extra bonus with a Flush or better. Get in on this Progressive Jackpot. 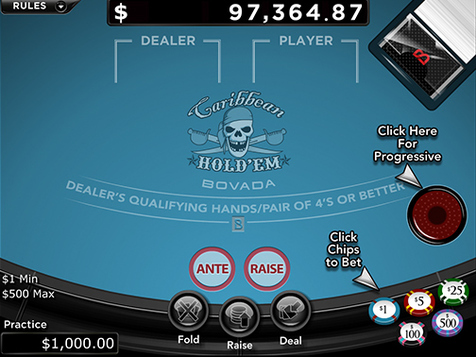 Learn how to play Caribbean Hold’em™ Poker with Bovada, Bodog. Both the Player and the Dealer are dealt two cards, face up for the Player, face down for the Dealer. These cards are known as pocket cards. This is followed by three community cards dealt face up in the middle for all to share (the flop). ​The Player raises by placing a bet that is twice the size of his ante if he thinks his hand is better or folds if he thinks it isn’t. Two more cards are dealt to the flop. Some or all the cards can be used to make the best poker hand possible. If you didn’t fold and the Dealer’s hand qualifies, both hands are compared to find the winner. The Dealer’s hand qualifies if he has a pair of 4’s or better.